Breastfeeding is the natural way of feeding an infant, but what happens when busy lives interfere with being able to feed directly? Breast pumps are an important part of the breastfeeding process, but most moms don’t want to carry them around directly as they go to work or social functions. Breast pump bags offer convenient storage in the form of a stylish accessory. The first consideration in choosing a bag is to consider the size of the pump you have and plan to carry in the bag. Do you have a single or a double pump? How large are the pieces and how compactly can they be carried? Also, will you be taking this on short outings or longer trips? This will impact how much cooler space you need in the bag and how much room you’ll need for extra supplies. Where you plan to take the bag and how you’re likely to use it will also determine whether you need a simple bag that holds the items or one that has external pockets that will permit the use of your pump without having to fully unpack the contents of the bag. Personal style is also a major consideration when selecting your bag. If style were not a concern, women would carry their pumps in the large, utilitarian bags that many of them come packaged in, but not only are these unsightly to many women, they’re also bulky and often heavy. Bags are available in nearly any style, from the very utilitarian to the chic and elegant, with plenty of options in between. The most important advantages are that these bags make your breast pump portable so that you can make trips without your child without impacting your milk supply or personal comfort. They also allow you to be discreet about the contents of the bag while emphasizing your own personal style. Many bags include cooler departments to store your breast milk while you’re out, keeping it safe for use when you get back to your child. First and foremost, make sure that your pump will fit in your bag. Choose a bag with an appropriate amount of cooler space to fit your travel needs. Look for an option that will be comfortable to carry and won’t make you feel self-conscious about the contents. You may be using this for an extended period of time, so opt for a durable bag that you won’t need to replace. The backpack design makes this easy and comfortable to carry and the numerous pockets offer plenty of storage. Most pumps fit easily into this bag and it has compartments to securely store the various parts of your device, but larger pumps may not fit due to the compact design of the bag. The bottle pockets are insulated, but this bag does not have or come with a separate cooler bag. It may be well suited to those with smaller pumps that plan to take shorter trips and need to keep both hands free. This bag would not be an ideal choice for those with the larger pumps or those that want a cooler bag they can remove for storage away from home. This is a stylish bag with silver hardware whose style is more reminiscent of a quality shoulder bag than a breast pump bag. It’s large enough to store most portable breast pumps with ease and has versatile insulated pockets on both sides that can store milk or the parts of your pump. With cooler packs, the insulated pockets will keep milk chilled for up to six hours. It has an interior zip pocket for important items and a smaller exterior zip pocket for quick access of items like your phone or key cards. It has both standard shoulder bag handles and a longer strap for versatility in carrying. This would be an excellent fit for the fashion-conscious mom that feels more comfortable with a large handbag and wants to be able to fit all of her essentials in a single bag rather than carrying her purse and a breast pump bag. 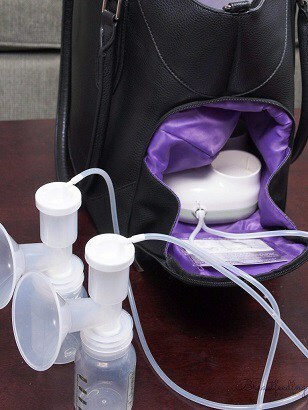 This is a very basic, lightweight, duffle-bag style breast pump bag. It will fit most pumps easily, but does not offer outside access to the pump. It has only two pockets: one to hold the pump and one to hold milk, making it less versatile than some of the other options reviewed on this list. There is no storage for personal items that would relieve the owner of a need to carry an additional handbag. The cooler compartment does not detach from the bag, but can keep milk chilled for up to 12 hours with a quality ice pack. This would be an appropriate option for the mom that only needs to carry her breast pump from one location to another and plans to then unpack it again. This is a rather large bag that is intended to fit most portable breast pumps, with the exception of the Medela Symphony, their associated parts, and even a laptop, lunch box, and personal effects of the carrier. If traveling with your infant, it can easily function as a combination breast pump bag and diaper bag. This is a true all in one bag for the mom on the go. It’s constructed of high quality nylon to provide durability and ease of cleaning. The bag has two side pockets for storing milk, allowing for longer trips than some of the smaller bags. The Kaylaa would be a great choice for mothers valuing style and discretion, but still wanting the versatility of a larger bag. This is another larger bag that provides a great deal of versatility. It’s large enough to carry most portable pumps without taking them apart between uses. The cotton canvas with water-resistant finish makes it both durable and lightweight. There is an outside zip pocket and two outside open pockets for quick access to frequently used items, as well as an adjustable, removable insert that allows the bag to be used as a tote bag, gym bag, or diaper bag when not in use as a breast pump bag. 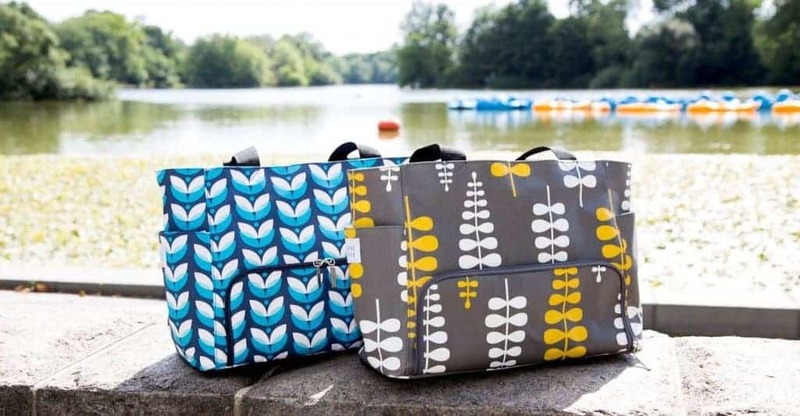 It boasts room for a laptop, cooler bag, bottles, and personal items, making it an excellent option for busy moms that need one versatile bag to handle everything. Each of these bags offers a different take on the classic breast pump bag, but the clear winner is certainly the Kaylaa Premium Breast Pump Bag. It offers plenty of space to carry the pump, its accessories, and your own personal effects all in one place. Multiple cooler pockets allow for longer trips and the high quality construction makes it suitable for everyday use. This would be an ideal bag for busy women and moms that travel frequently or need to be away from home for extended periods of time. It resembles a very large purse or small weekender bag, but it lets the active mom organize everything she needs in one place and provides style in addition to functionality.